In mass production instead of a single sewing machine, different types of machines are installed. What types of machine mix one should purchase depends on the product category that you want to make in his factory. As you know for knitted garments you need a higher number of over edge and flat lock machines where for woven products you need higher no. of lock stitch machines. When you plan for a new factory set up for garment manufacturing you should select machines based on your product profiles. Otherwise, you will have wrong machine ratio. As a result, you will fall short of some types of machines and others will be less utilized. It is not only the selection of correct types of machines but you should have also the correct number of machines for all types of machine you purchase. If you purchase machines only those are required initially then you can control in initial capital investment. Here is the secret how I select machine mix for a new set factory. Select Product Type - As I mentioned above, the requirement of machine types will depend on product types and product styling. So, first thing is you have to decide what are you going to make. Is it Men's shirt, Blouse, Tee-shirt, Trouser, Salwar Kameez or Kurti? If you plan to make multiple products in your new set up, then define how many units do you like to make per day for each product. Daily Production Target: Once you finalized the product or products you wish to make, decide how many units (pieces) would like to produce monthly or daily. OR in another way what is the average production demand of your customer. As an example, let you plan to produce 1200 Shirts per day. Estimated Line Efficiency: At the start-up stage you may not be aware of the efficiency. But you have to consider an efficiency figure at what level your line may perform 6 months ahead to calculate machine requirement. As most of the factories run at 40% efficiency (India), use this figure for calculations. Or if you wish to consider a higher figure you can. Prepare Operation Bulletin: Next step, you need to seek help from the industrial engineer to prepare operation bulletin (OB) of the product. Engineers will analysis the product and check what all types of operations (jobs) are needed to make the garment, selection of correct types of machines for each operation and then calculate product SAM, no. of machines for each operation, machine requirement per line to get production as per your target. For multiple products prepare OB for each product and calculate machine requirement accordingly. Calculate no. of lines: Divide daily total target by per line estimated production to calculate no. of lines. For example, if you plan for 400 pieces per line per day then you need to set 3 lines to get 1200 pieces per day at defined line efficiency. Make a matrix of machine mix: Once you have line wise calculated no. machines for each product prepare a table with machine list of each product. Calculate total no. of machines for each type. 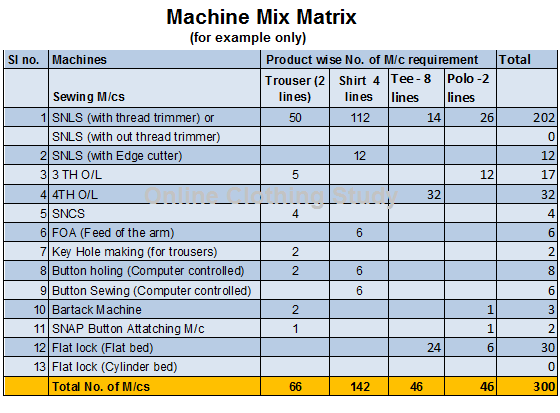 Refer to the following image for the machine mix matrix. You are ready with your machine requirement for your new factory. If you still have some queries on the above procedures then please drop a question in the following comment box. Online Clothing Study: How to Determine Machines Requirement for a New Factory? When you plan for a new factory set-up for garment manufacturing you should select machines based on your product profiles.